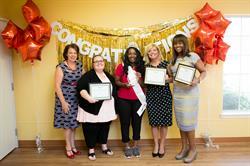 FORT WORTH, TX--(Marketwired - May 05, 2017) - Learning Care Group is proud to honor Esther Drisdale from La Petite Academy in Fort Worth, Texas as this year's recipient of the company's prestigious Teacher of the Year award. Drisdale has been selected in recognition of her remarkable work in bringing lessons to life in fun and imaginative ways to ensure children are ready for future academic success. She was chosen from among nearly 18,000 early education teachers nationwide from La Petite Academy and its sister brands in the Learning Care Group portfolio of schools. Drisdale, a Lead Pre-School teacher, is being honored for her excellence as an educator and for the inspiration she provides to students and staff alike. "Esther has a unique gift for celebrating accomplishments, providing encouragement and ensuring every child feels cherished," said Kristine Webb, Southwest Division Vice President for Learning Care Group. "She has a special talent for bringing out the fun in every aspect of the school day, finding creative ways to make learning an enjoyable experience for all. Her enthusiasm for teaching comes across in everything she does. We're honored to have Esther represent us as our Teacher of the Year." La Petite Academy provides comprehensive early education and care services for infants through Kindergartners. Unlike traditional daycare, the La Petite Academy education provides a strong curriculum in a safe, stimulating environment to create meaningful learning experiences for children every day. With La Petite Academy's proprietary School Readiness Pathway, families can choose the educational programs that best meet their child's needs. Teachers stimulate problem-solving and critical thinking skills, developing unique and individualized lesson plans to address children's abilities, strengths, and needs. Parents can be assured their child's learning goals are being met, thanks to an exclusive data-driven process that links individualized observation with assessment and lesson planning. La Petite Academy's Early Innovators curriculum inspired by STEM -- science, technology, engineering and math -- is helping children in the Preschool and Pre-K programs further develop their skills as natural-born engineers and scientists. For more information, visit www.lapetite.com.